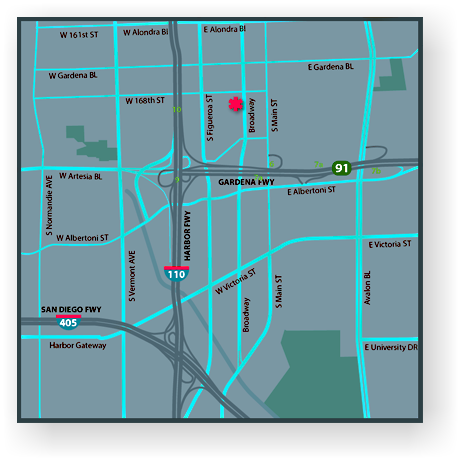 L&L Tool & Die is located on South Broadway, a few blocks north of the 91 Freeway in Gardena, California. Exit Redondo Beach Blvd., turn left on Redondo Beach Blvd., turn right on S Broadway. L&L Tool & Die is on the right. Turn East on the 91 Freeway, Exit Main Street, turn right on Albertoni Street, turn right on Broadway. L&L Tool & Die is on the left. Exit Main Street, turn right on Albertoni Street, turn right on Broadway. L&L Tool & Die is on the left. Exit Main Street, turn right on Main Street, turn left on Walnut, turn right on Broadway. L&L Tool & Die is on the left.